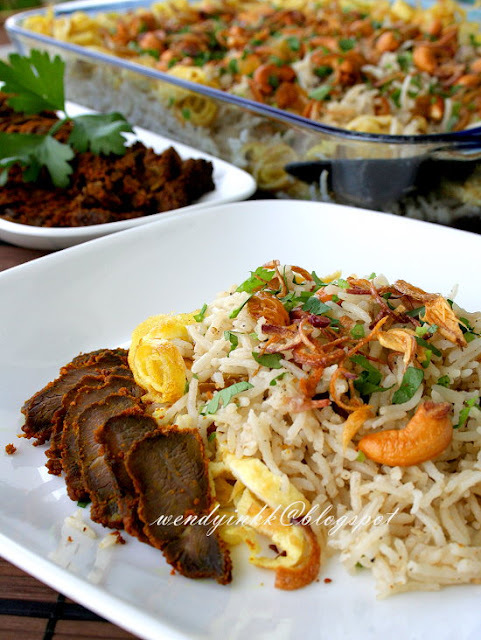 Nasi Kebuli is considered as the heritage dish of Kuala Lipis district, some even call it as Pahang's Royal Rice. It was said to be created in 1944 for a Sultan who reigned from 1914-1917. I can't explain this, but maybe you can read about it here, but it's in Malay. I actually cooked this twice, once for family consumption and another time for Reuben's birthday party. I got good comments from all who ate this saying it's very delicious. The rice has a unique fragrance, not strong, but subtle enough to add highlights to the flavour of the rice. The use of kaffir leaves, mint and lemongrass makes it special. This rice is absolutely yummylicious! The rice is good enough on its own. Accompanying dishes are bonuses. 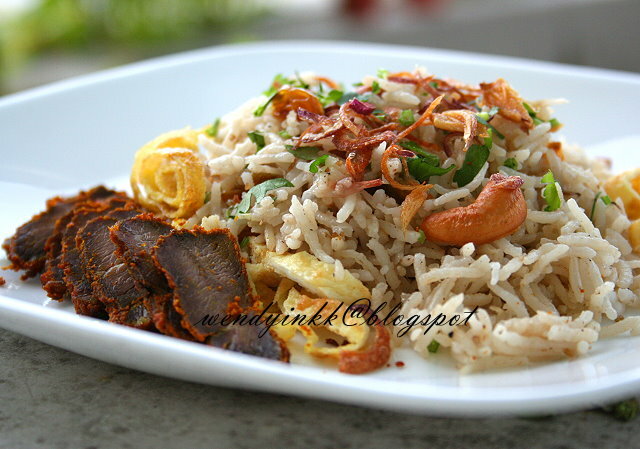 Actually in Indonesia there is nasi kebuli too, but the recipe is different. Even in Kuala Lipis itself, I believe every chef will have their own version, but what doesn't change are the type of spices used. 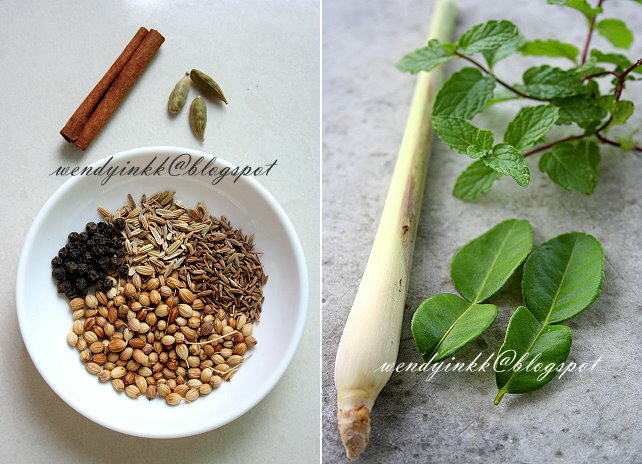 Some recipes call for mint, some call for kaffir leaves... So in the end I decided to use all the leaves called in the recipes I found and I am glad I did because it is soooo nice. There is a taboo regarding this rice. One must wear very clean clothes to cook it, if not your rice will not taste good. Is it real? Hmmm... I don't think so because how clean can I be when I was slaving away the whole day in the house with 3 kids. Sweaty, stinky and all. LOL. My rice still taste fabulous! Myth busted! 1. Wash rice and let it drip dry in a colander. 2. Heat wok on medium heat and put in oil and butter. Saute onions, garlic and ginger, cinnamon stick, cardamom and all the ground spices until very fragrant and the onions are translucent. 3. Put in rice and toss it around. 4. Put in water, coconut milk and salt and bring it to a boil. 5. Add in lemongrass, kaffir leaf and mint. 6. Let rice cook until done. Let rice sit for at least 30 minutes. 7. Fluff rice and then top with the condiments. 8. 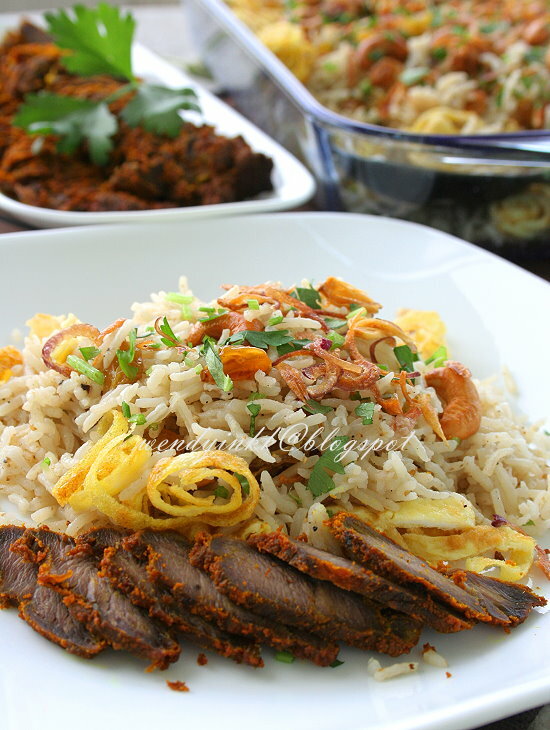 Serve rice with daging bakar/pacak or preferred dishes. Transfer everything over to rice cooker at step 4 and cook until rice is done. Do step 7 and 8. Do step 1-3. Skip coconut milk in step 4. Do step 4 and 5. Then transfer to a microwave vessel and zap on high for 5 minutes. Put in coconut milk, lightly stir rice and zap for another 5 minutes. Continue with Step 7 and 8. Absolutely DELICIOUS. I've never heard of Nasi Kebuli before until now so thanks for the background info and mini history lesson ;p Sounds and looks absolutely beautiful to eat I'd love to try. Btw when I saw KK in your blog name I thought you were from Kota Kinabalu (my hometown) haha.Great blog! Looks so yummy and attractive clicks. what a great dish,wendy..!! *this is always become a great idea for dinner menu. 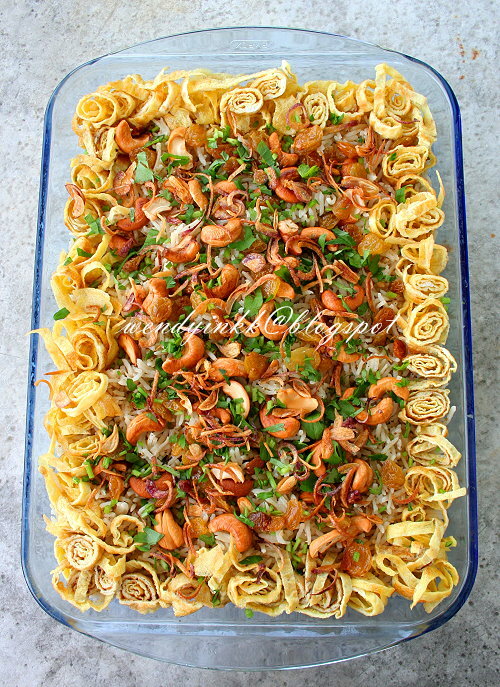 hm.. maybe I will make this for christmas dinner menu, better than turkey dish..
Once again you have done it Wendy! Excellent way of producing great food that is easy for us - home maker to try. You save a lot of greys, otherwise we have to crack our head figure out what to cook next. Thanks Wendy! HE calls you blessed! wow... it looks so delicious! !